A Feast for the Soul in Vienna. Your Suite Ship® is Ready for Boarding. ACTIVE Join your Avalon Adventure Host and hike up to the castle ruins to take in the spectacular view of the village, the Danube, and the Wachau Valley below. 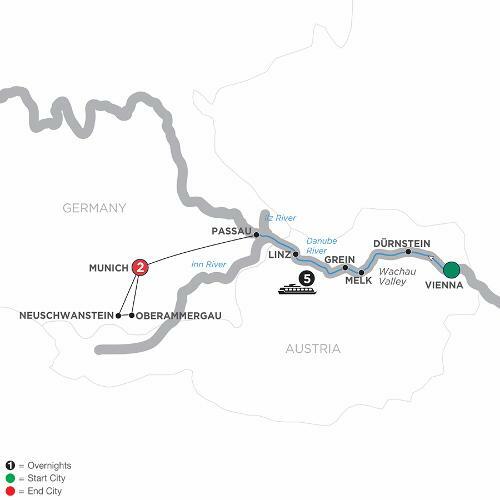 You may stretch out on the Sky Deck as you sail through the Wachau Valley past vineyards, castles, and charming villages on your way to Melk. CLASSIC Take a Guided Walking Tour of Grein, see its historical theater—the oldest in Austria still holding performances today. Cruise to Linz this afternoon or meet your ship after your excursion. Enjoy the afternoon with coffee and a piece of authentic Linzer Torte. Sail through the Schlögener Schlinge—named the Natural Wonder of Austria, carved by the power of the river into a dramatic landscape. ACTIVE Take a Nordic Walk with your Avalon Adventure Host. Later, in your free time, enjoy a bike ride by the Danube or a stroll through the delightful village of Passau. Please check visa requirements with your local consulate(s); responsibility for obtaining visas rests with the traveler.to change. If a change becomes necessary, a substitute will be offered.